For many years I have been using Deep Sky Stacker to align and stack my short exposure frames to give the result of a longer exposure. The latest 64-bit version seems very stable. More recently, two new stacking programs have become available; Starry Landscape Stacker (~£38.99) and Sequator (free, but a contribution by paypal for a cup of coffee or two is suggested). The former is only available for the Mac and the latter for Windows. They both have the ability to treat the sky and any foreground separately – great for wide angle night landscapes. In this case, a fixed tripod is used with exposures short enough to prevent star trailing. 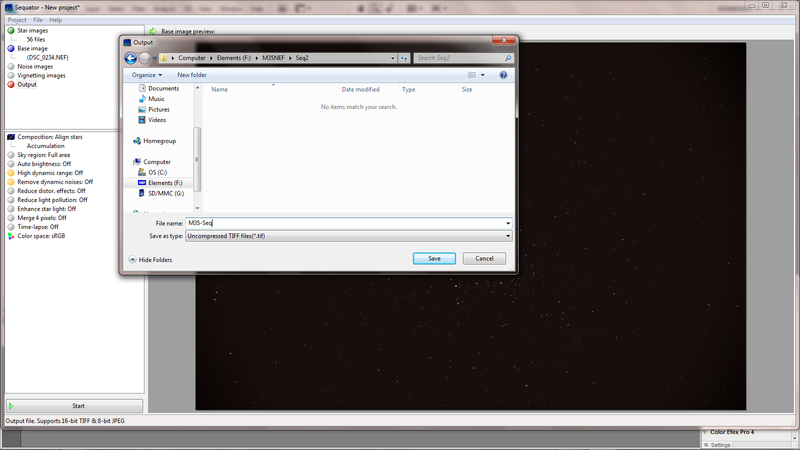 The sky area is selected leaving the foreground unselected. The programs will then stack the sky area accounting for the movement of the stars across the sky but stack the foreground with no movement. As a result, the stars within the sky will be sharp as will be the foreground. Clever. I currently do not have any wide angle data to try out, but decided to test Sequator with a set of Nikon raw files that I have extensively tried out with Deep Sky Stacker. The raw frames had been taken using a full frame Nikon D610 attached to a CFF Telescope’s 127 mm apochromat refractor employing an aspherical oil-spaced triplet objective. The D610 was controlled over a USB cable from an Android tablet using the program qDslrDashboard and took 56, 20 second, exposures at an ISO of 800. No darks or flats were taken. The telescope has a 3-inch focuser but, having a 2-inch barrel, could not be expected to cover the full frame sensor. As a result, the field was significantly vignetted but the two clusters were well covered. 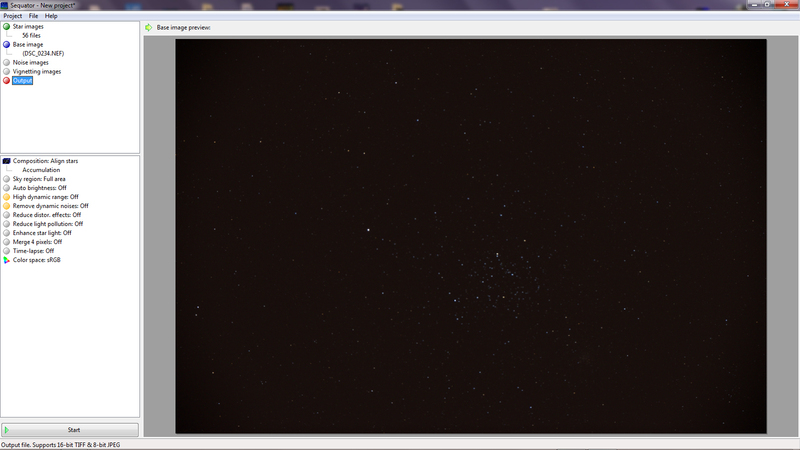 I was not using a field flattener, but the stellar images were perfect across the unvignetted field of view. In an extensive article, ‘Deep Sky Stacker: could it be worth first converting raw files into Tiffs? 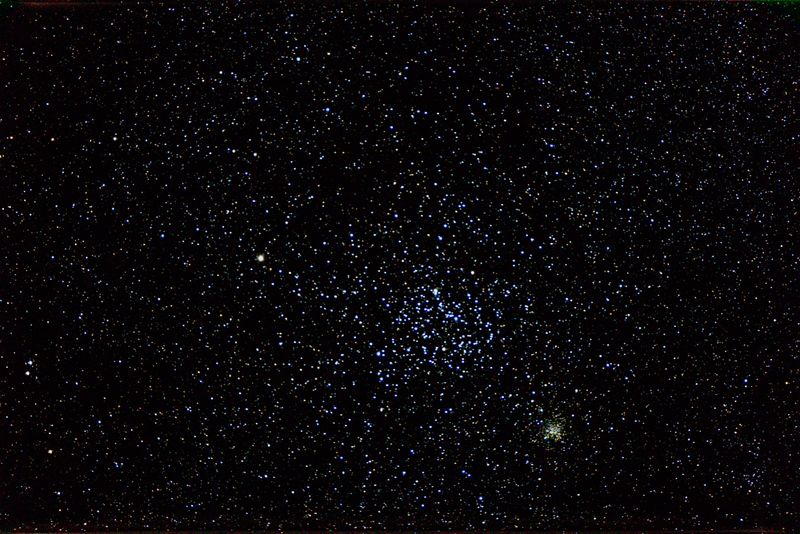 A case study imaging M35 and NGC 2158’, I came to the conclusion that the best results were obtained when the .NEF raw files were first converted into Tiff files. It could be well worth reading this article. 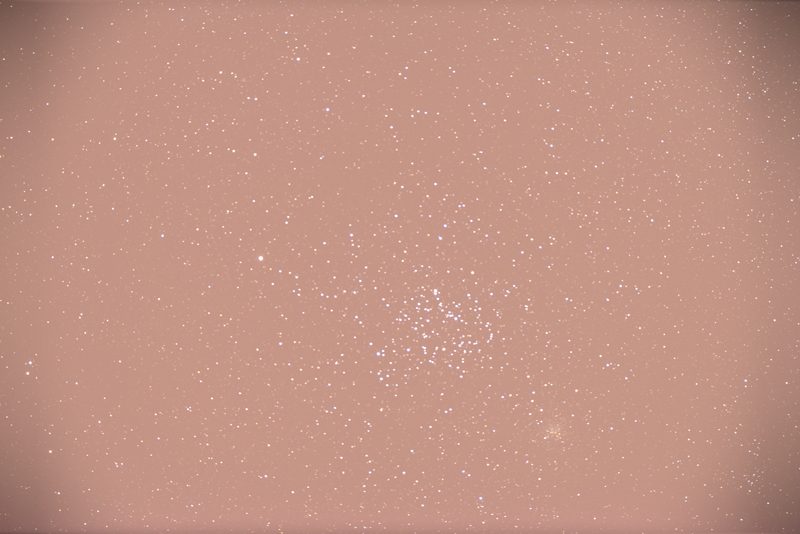 I discovered that the result when stacking the Tiff files derived by Raw Therapee gave a far better colour to the bright blue stars within the cluster than that derived directly from the .NEF raw files in Deep Sky Stacker and that the star images were somewhat tighter. This could possibly be that Raw Therapee uses a more sophisticated de-Bayering algorithm or that Deep Sky Stacker overexposes them when processing the raw files so increasing their size and reducing their saturation. So, along with quite a number of other astrophotographers, I have been first converting my raw files into Tiff files before stacking in Deep Sky Stacker. So I was very interested to see how Sequator handled the raw files. It has a very simple interface and is far easier to use by beginners. There is no need, for example, to first set the star detection threshold. It is also far faster: for this set of 56, full frame, raw files, Sequator took just over 2 minutes using my i7 laptop whereas Deep Sky Stacker took over 13 minutes. The Sequator opening screen has a set of commands at its left which should be applied downwards in turn. A double click on the top button allows one to select the frames that will be aligned and stacked. For a stack like this, there is no need to specify a reference frame with Sequator selecting one from the middle of the stack itself. Perhaps surprisingly, before the aligning and stacking takes place one needs to select the name of the resulting Tiff file and the location into which it is to be placed. 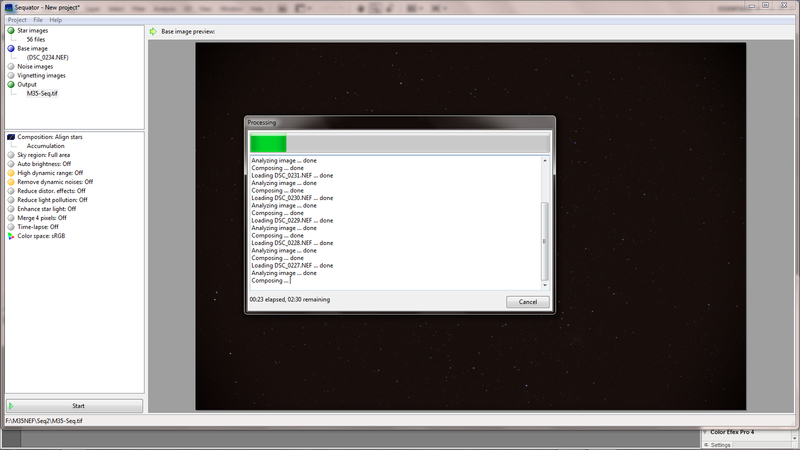 There are various stacking options, for example, the ‘Remove dynamic noise’ mode will attempt to eliminate hot pixels. I suggest that you try these out with a small number of frames to see what suits your data best. The ‘High dynamic range’ option tries to prevent parts of the image ‘blowing out’ so helping to preserves the star colours and does a great job of suppressing the significant light pollution that is within the frames. The Sequator manual (https://sites.google.com/site/sequatorglobal/manual) gives a description of all the stacking options. Having tried out various alternatives (possible as the stacking process is so quick), I came to the conclusion that, for this data set, the best final image came when selecting none of them. 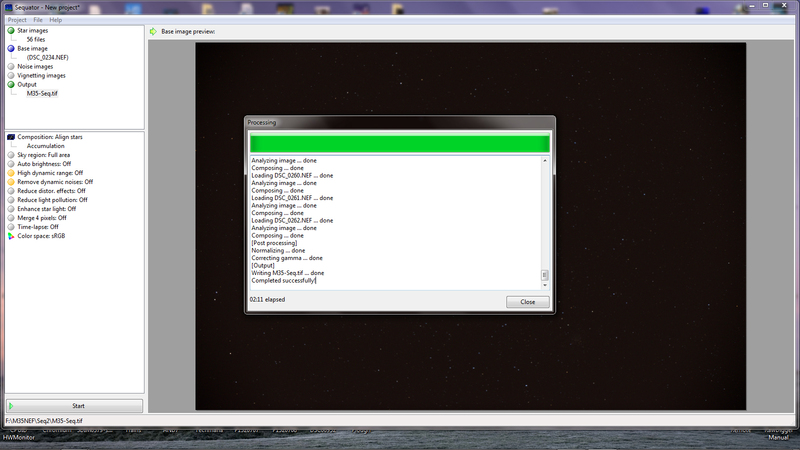 Having set up the program options, one simply presses ‘Start’ and watches a log of the progress. After the ‘Successful completion!’ statement (note the elapsed time) as seen in the first image below, one clicks on ‘Close’ and the stacked result appears as in the the second image below. This looks exactly how the resulting Tiff file will appear when opened up in, for example, Adobe Photoshop or GIMP, in great contrast to the image that appears having stacked the frames in ‘Deep Sky Stacker’. 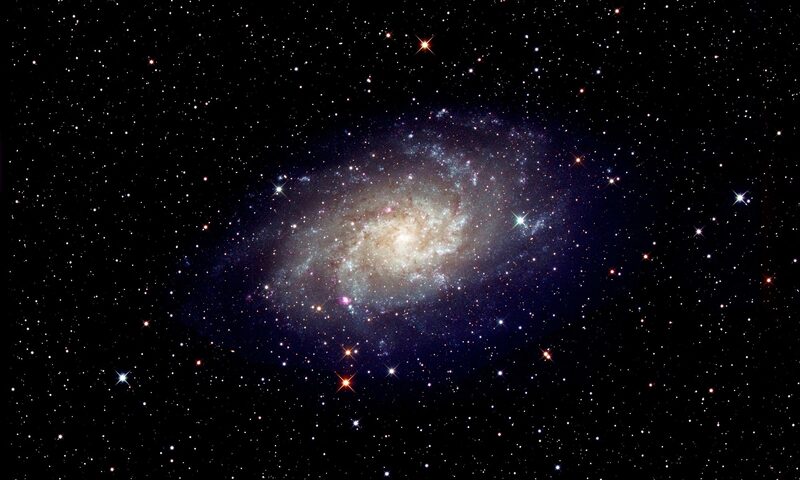 Surely it would be easy for Deep Sky Stacker to give a similar image. A minor point, but one up to Sequator. 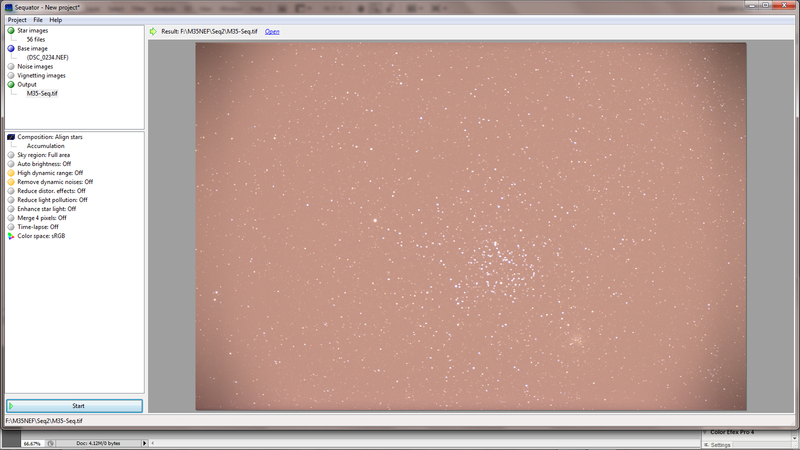 The output file below shows the significant light pollution from my town location. 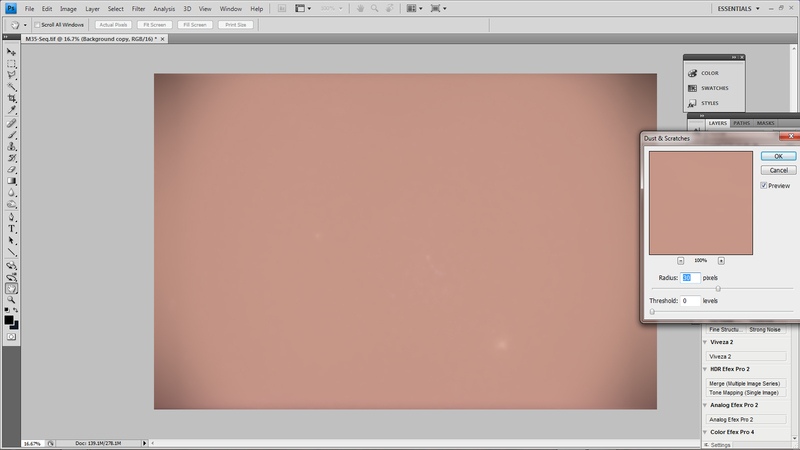 I then used my standard ‘light pollution removal’ technique in Adobe Photoshop: The image was duplicated and the ‘Dust and Scratches’ filter applied with a radius of 30 pixels. The filter ‘thinks’ that the stars are dust and removes them! 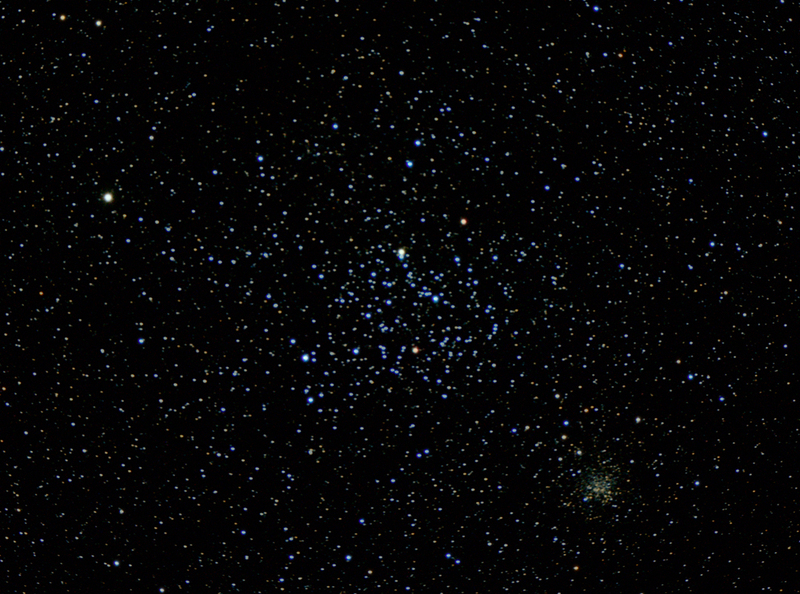 Some of the brighter stars in M35 and the small cluster NGC 2158 still remained in the image. These were cloned out from nearby regions and then a Gaussian Blur applied to give a very smooth rendition of the light pollution. 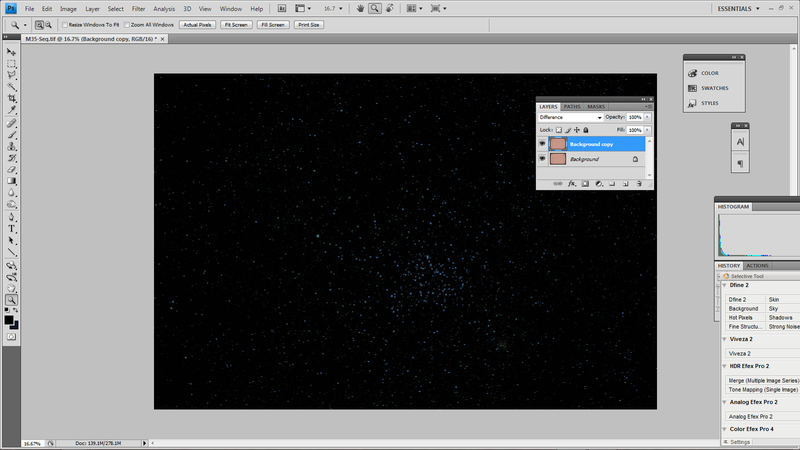 The two layers were then flattened with the ‘Difference’ blending mode selected so removing the light pollution. This image was stretched using a curves function. 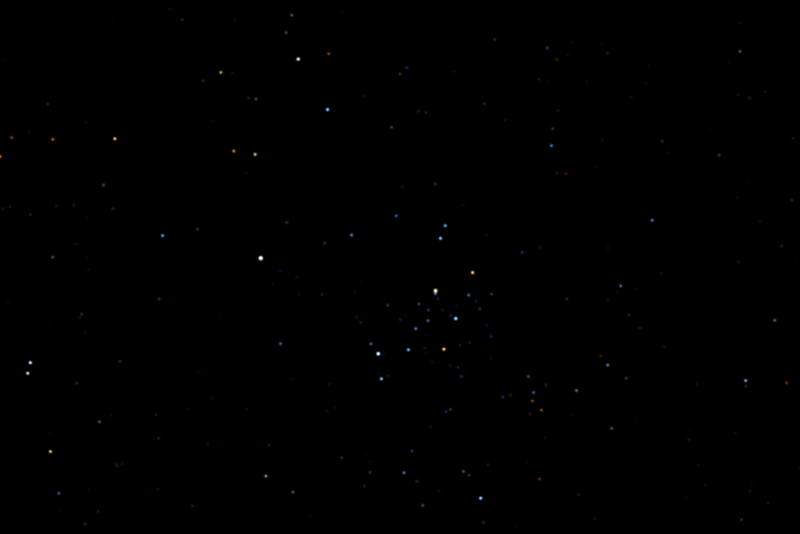 The Sequator result shows bluer stars within the M35 cluster which are slightly tighter than those from Deep Sky Stacker when processing the .NEF files and gave a similar result as when Deep Sky Stacker processed Raw Therapee Tiff files. I was disappointed that, in both cases, the colour of the red giants, very obvious in a single frame, had not been retained. To bring out their colour, I first produced an enhanced image of the brightest stars in the image derived from a single frame. 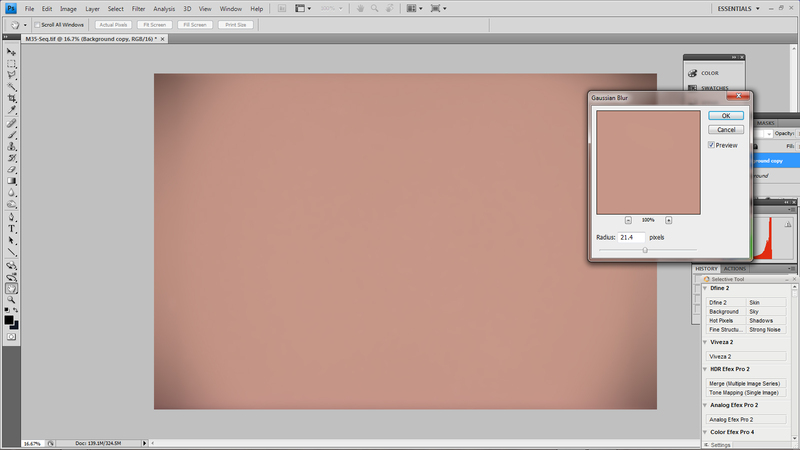 I then ‘added’ this image into the main image using the ‘Screen’ Blending mode to give the final (cropped) result. I also used Sequator to stack the Raw Tharapee derived Tiff files. I found no obvious difference between this and the result from stacking the raw files and so assume Sequator is using a quality de-Bayering algorithm. Though I was able to achieve a similar result when stacking Tiff files in Deep Sky Stacker, it took a few minutes to derive the Tiff files and then 13 minutes to align and stack them. In contrast, the complete Sequator process took just over 2 minutes. This makes me think that for this observing project Sequator was the better option.